Team USA captain Jim Furyk didn’t waste any time in making the big announcement in Philadelphia. "I’m gonna cut to the chase,” Furyk said. “The three members of the team are Bryson DeChambeau, Phil Mickelson and Tiger Woods.” The picks come as virtually no surprise. DeChambeau is the hottest player on Tour at the moment, and both Tiger and Phil were viewed as virtual shoo-ins when they didn't automatically qualify. 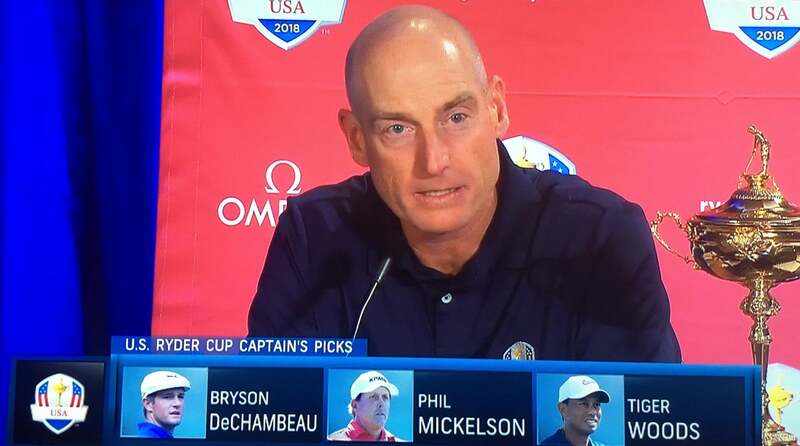 Jim Furyk announced his first three captain's picks and three additional vice captains from Philadelphia on Tuesday. What happened next, however, was a surprise. “Tiger and I have had this conversation and I’ve been asked about it all year,” Furyk said. “And what Tiger and I have decided is he will play in this Ryder Cup and I will name another vice captain. Collectively, his role won't change much, but he will be considered a player, and not a vice captain. "With that, I'm going to name three vice captains today, in David Duval, Zach Johnson and Matt Kuchar." Johnson (five appearances) and Kuchar (four appearances) are Ryder Cup veterans, and the case could have been made to consider each of them for the final captain's pick. But given Furyk's decision on Tiger's vice captaincy, he seems to have closed the door on any speculation that Johnson and Kuchar would be surprise last-minute picks. Duval was perhaps the most unexpected pick. The former World No. 1 has not played the tour regularly since 2012. He played in two Ryder Cups (1999 and 2002) and had a 1-3-2 record overall. He's been working as an analyst for Golf Channel since 2015. The three newly appointed vice captains will join previously announced vice captains Davis Love III and Steve Stricker.